Despite the flooding and bad times that Hello Games have had recently, they’ve just released their sequel to the popular Joe Danger, and despite being what is essentially more of the same, the game remains fun, and will keep you going. That ten minute play time you said you were going to take before getting started on housework? Well, six hours later it’s time for bed. 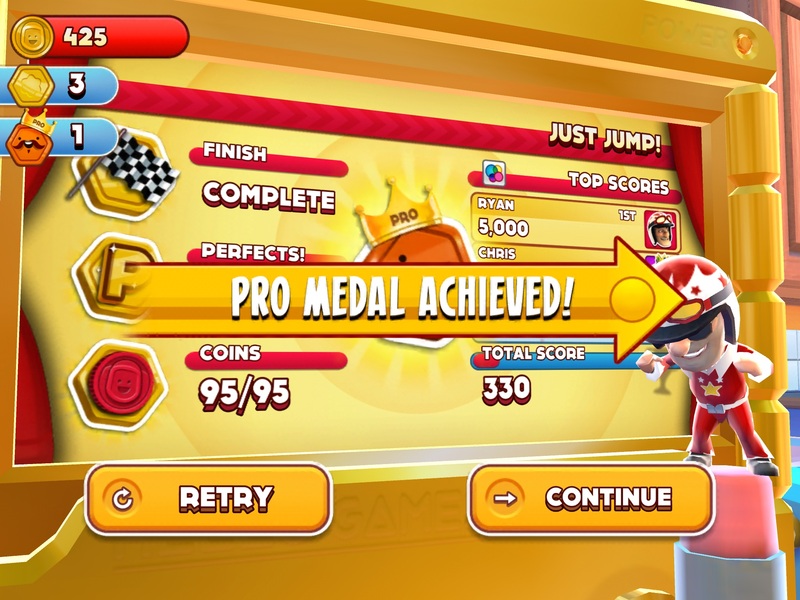 In Joe Danger Infinity ($1.99), you start off playing as the titular hero as he journeys through what, despite the title may lead you to believe, many levels that do have a finish line and therefore end. Starting with your trusty motorcycle, you find yourself on a kitchen countertop. The backgrounds are very well detailed, and have lots of little effects you should look out for as you progress through the tours. As you make your way through the game, you’ll change locales, and eventually make your way through the house. The formula doesn’t stray far from the original, and you’ll be tapping on special items as you jump, collect coins, do tricks, race others, disable barriers, go through loop-de-loops, duck through tunnels and change lanes. Bonus levels also return. My favorite is the whack-a-mole, with moles that pop out of random locations and make noise as you drive by. Personally, I’ve found it a lot easier to perform stunts in this game than in the previous iteration, but that could just be me. What is quite fun, and challenging, is using the fastest vehicle in the game, while performing stunts, all the while trying to collect all the items you don’t automatically run across. Your fingers will get a workout, but the entertainment is wonderful. The theme in Infinity is cute, charming and well done. Basically, you are action figures. Upon starting the game, you tap to break Joe out of his packaging. This theme continues when it comes to unlocking new characters, as you’ll earn gumball tokens, which dispenses a random character. Of course, if you don’t want to wait, you can always buy them early with IAP. Characters are split up into groups (Team Toy, Team Danger, Team Nasty and Team Adventure). Each character provides a score bonus and has their own star rating. While coins do come quickly, accumulating the tens of thousands to unlock even the cheapest characters will be either a long grind (perhaps that’s the infinity reference? ), or a quick purchase. Just like in the first game, the soundtrack is upbeat and catchy, but does quickly get old, as there’s not much variety to it. The announcer makes his return, whether you love him telling you to look out with every barrier, or hate him for it. Aside from Joe’s stunt bike, you will use another sixteen vehicles throughout the game! All but one vehicle will be unlocked as you progress, but you can also choose to unlock them early by spending coins. Each vehicle also comes with its own coin bonus. The Golden Warrior bike is the only vehicle you can’t unlock through normal play, and costs 100,000 coins outright. Using this bike will double all coins earned, so again, depending on how much you want to grind, it’s an option. Some vehicles have special abilities. For example, the Muddy Mike (basically a military humvee) can crash through barriers, or the Duckbike Platypus, which bounces out of cereal, soup and water. Random, yes. Cute? Very. As mentioned earlier, there is IAP in Joe Danger Infinity, but none of it is required to enjoy the game, and there is no paywall whatsoever. Coins are fairly cheap too, with the most expensive IAP being under $10 for 500,000 coins. Most vehicles are 100,000 coins each, while characters will run you from 40,000 to about 100,000 each. I find the worst use of IAP is when you fail a level too many times, you’re presented with “boosts" that can draw coins to you, make you invincible (rendering some of the challenge of the levels obsolete), or increase your score. 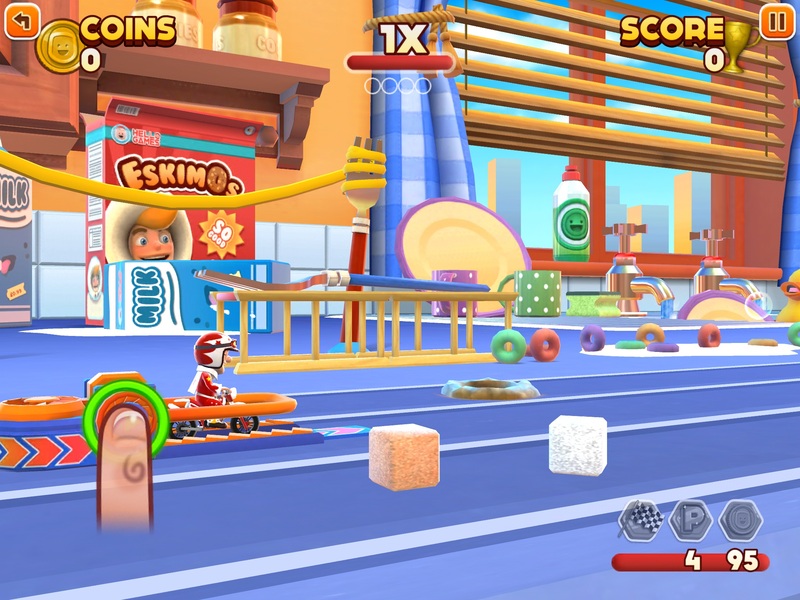 Joe Danger Infinity has a terrific theme, sure to be fun for everyone who plays it, and will keep you coming back to beat your best and keep climbing the leaderboards. There’s no paywall to hinder your progress, and each level has a three-objective rating for the completionists in us all. However, it’s basically a fresh coat of paint on Hello Games’ previous formula, and while that isn’t a bad thing, it also means there isn’t a lot new. The biggest addition are the vehicles and their special abilities. Fans of the first game can’t go wrong for $2.99.